In years past, we inherited (against my husband’s better judgement) several quail. These beautiful little birds produce delicious eggs in addition to an endearing chirrup when you say hello. 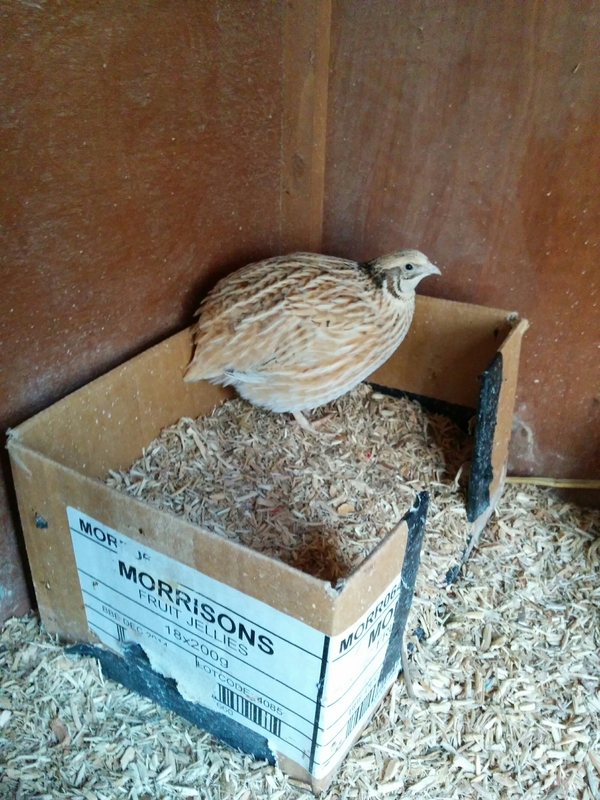 Our quail were kept in a converted rabbit hutch which gives them a darker enclosed area for laying and a brighter area with a view of the outside world. Latterly, Geoff built us an extension to the quail coop, making it into an L-shaped enclosure to fit into the corner of the chicken coop. The new extension floor comprises of turf to protect their feet and has no solid walls, just wire to allow them more room in the fresh air. Their food consists of a mix of chicken layers pellets, porridge oats and quail seed. We also make sure to give them plenty of greens, usually grass or weeds, which not only supplements their diet but allows them hours of fun playing hide and seek. We clear them out about once every two to three weeks as they don’t produce even a quarter of the mess that the chickens do. Sadly we lost three of our quail in the first year and the remaining three quail the following year however, they were extremely old! I hope to acquire some more quail in the future. Our quails tended to lay an egg a day each during the summer and into autumn. The egg production drops as we head towards winter. Quail eggs are small and seem to range in colour from cream with brown splodges to green/blue with brown splodges. Quail aren’t like chickens when it comes to laying. Despite having a sawdust filled nesting box to use, the quail tend to lay their eggs haphazardly across their enclosure meaning you have to hunt for them in the sawdust.